Using a structured query language to mine Wikipedia. Nice stuff. Slick Firebug add-in that gives a checklist of items to improve page performance. Incident management meets security ratings. Many features of interest, including the built-in static analysis capabilities in XCode. Where was the Cabell House? The standard biography of the Virginia Glee Club traces their formation to the creation of a glee club at the University of Virginia’s “Cabell House,” which the group’s history calls the “Cabell House Men.” Inspired by my visit to the University this weekend, I went digging to find where and what the Cabell House was. Jefferson’s original university design had 54 student rooms on the Lawn and a similar number on the East and West Ranges, holding somewhere between 150 and 200 students (assuming double residency for all the Lawn rooms except the Bachelor’s Row). So the growth in University attendance from 128 in 1842-1843 to more than 600 in 1856-1857 (figures from Philip Bruce’s History of the University of Virginia vol. III), combined with the lack of further dormitory space, led to a growth industry in Charlottesville boarding houses. One of these was the Brock Boarding House, later known as the Cabell House. 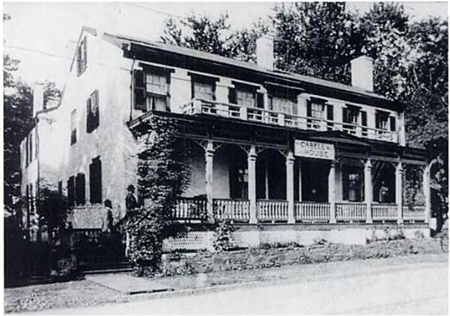 Later called the “Stumble Inn,” the two-story brick structure, located on the north side of West Main Street between 9th and 10th, was ultimately razed. Today the block hosts a handful of businesses and a book shop and overlooks the train station on the other side of West Main Street. The Glee Club’s formation wasn’t the only brush with fame the Cabell House had, however; it was also infamous as the site where John Singleton Mosby, later famous as the Confederate raider known as the Gray Ghost, shot fellow University student George S. Turpin. 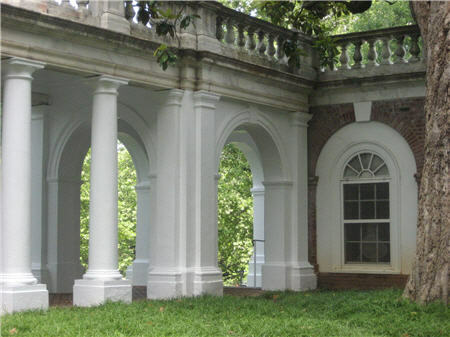 Author Tim JarrettPosted on June 9, 2009 December 1, 2013 Categories VirginiaTags uva, virginiagleeclub2 Comments on Where was the Cabell House? I returned yesterday from an extended weekend attending my 15th class reunion at the University of Virginia. It was a great weekend and I had a lot of fun, though not necessarily because of the reunion itself. We started the weekend on a rocky note, driving through pouring rain through Connecticut and New York before it finally cleared away when we got to New Jersey. Lisa and I drove on solo the next morning and made it to Charlottesville about 3 pm. I had grand plans of catching up with a few folks in town but was exhausted by the drive and we punted, managing only to have a few drinks at Michael’s Bistro and to get over to L’Etoile. Okay, so that wasn’t such hardship. In fact, Friday was a pretty amazing date, the first we’ve had in quite a long time. Saturday was a more structured day. This year I went in with the expectation that we would go to a few things that interested us and otherwise spend most of the day with friends. And it worked out that way, kind of. We did hear Julian Bond speak about the connection between civil rights, changing demographics, and the evolution of R&B and rock music–an unexpected but pleasurable discussion with an old professor, if not perhaps as consciousness raising as some of Bond’s past lectures have been. The reunion part of the weekend was the least successful, primarily because the 15th reunion is not too well attended for a lot of folks, and partly because I didn’t sign up for enough fun activities. (Lesson learned: will sign up for wine tasting next time.) But we had a great time catching up with Greg, Bernie, Anne and the other folks from the class that were there, and the reunion left me wanting to go back in five years and do it again–which I suppose is the goal of all good reunions.